While completely true, that eschewing of careful study and analysis of the detail left a gap in my work that I’m now trying hard to close. After years of making, I’m a complete convert and preach the gospel of sampling at every opportunity. Brace yourselves, friends, because here I go again. There’s a reason why we did homework problems in school. (I swear this is relevant!) Remember those pages and pages of math problems where you were effectively solving the same type of problem over and over again? Or constantly correcting the grammar of sentences? My high school grammar teacher (why yes, I took grammar as an elective during my senior year. Do you need more reason to believe I’m a bit touched?) would hand us a single page of 8 1/2 x 11″ paper each morning that was jammed on both sides with sentences, single spaced, in need of proofing. In junior high, the equivalent was a piece of paper with sentences that needed diagramming – at least a dozen each day. I could list loads of other examples of repetitive, focused work that was assigned to me over the years and tell you how much I initially hated doing them. However, after a time, in almost every case, I came to relish those papers hitting my desk. That stream of problems in the back of the book (if we were assigned “all the even ones”, I did the odds as well. You know, for fun.) requiring not only answers but also elaborate drawings in order to prove my point. After three semesters in college calculus, my homework assignments looked like the illustrations in a textbook. Honestly, I loved it. Loved. It. I’m sure you can see where I’m going with this. Swatches and sample cloths are homework. It’s the basic learning that we have to do in order to confidently approach more complex patterns in the future and enables us to design our own pieces. All the decisions that we have to make in designing and executing a piece – yarn, color, structure, finishing – are informed by that body of knowledge we’ve accumulated through the course of what we’ve made already. And yes, a sweater is a sample – a fully-executed one. But! All the other mini-samples I made along the way are completely relevant and useful. Useful because there’s learning to be had from each and every part of the process and also because the act of making the sample helps cement the process in my mind and in my hands. I am learning each time I warp, each time I thread, each time I cast on – whether it’s a swatch or otherwise. It’s the homework I need to do so that I can confidently move on to the next lesson. We all knew that homework was necessary when we were in school, so why should learning a new skill be any different? Just because it’s self-directed doesn’t mean it’s any less valuable or less important. I’ve got four of these already and, lucky me, I need to make about 30 more. I saw real progress from the first to the fourth and only stopped because I had to get on a plane and my little tubs of paint are 3oz of gel that wouldn’t get by the TSA. To get to the 30 good ones, I expect to make twice that amount. At least two of each one, so now I’m up to 90. Each of them will be a sample – and each sample will help me get better. Finally, finally I understand why truly amazing artists will make the same pot, paint the same landscape or knit the same sock over and over and over. Keep doing it until it’s right, and then do it again – just to make sure you’ve got it. And then again, because the third time’s the charm. And once more because you want to prove that you can. True skill, true mastery is not in the single making of an amazing thing – but the ability to make that amazing thing over and over. Which means sampling. Apprenticing. Working. Making. I’m about to get on a plane again, this time to go home. To my little paint pots and brushes and watercolor papers. And a pile of homework so high that it’s threatening to fall over. I couldn’t be happier. This entry was posted in Knitting, Miscellaneous, Spinning, Weaving. Bookmark the permalink. Interestingly, I am coming to the same conclusions about sampling…and am enjoying doing honest-to-goodness samples (on and off loom) rather than only full-size samples (aka towels). So, what is the goal of the color wheels? To make the gaps between hues even? Just curious. I’m taking a class on color – and the goal of these wheels is to be able to mix colors that aren’t available out of the pots. We do have a set of Masters that we use as reference, so it’s also about training our eyes. Specifically, for these, I had to mix the tertiary hues as well as the green. Interestingly, the Blue/Green was my biggest challenge. 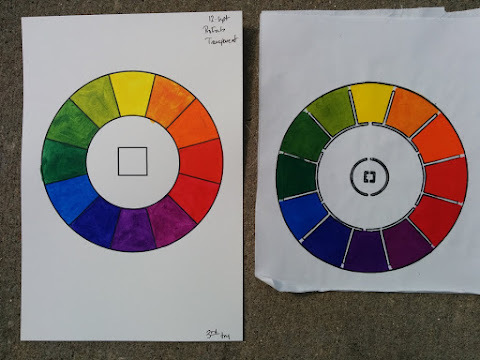 The next round (which is due in two weeks) is to paint a value scale from black to white and also to take each of the 12 colors on the wheel and paint them into white and into black. So, 24 color wheels, plus a value wheel. Fun! I find that if I sample or work on a series of projects working up to the “big” one, it takes the edge off having to be perfect. I am making this towel of the same fiber as the table cloth I am planning, the point is learning what the yarn, sett etc will be. I will still have a usable towel before I get to the fabric I want for the table cloth. So glad you are having this converstation. Thanks for joining in, Charlene. And I hope you’ll end up with a fleet of towels as you work toward the table cloth. Just one won’t be nearly enough! I love this connection between homework and sampling. Both are a chance to practice the skills we need. It helps me both enjoy sampling more because like you I liked solving homework problems and using this analogy in my classroom. I get frustrated with samples as well. I am taking the Olds College Master weavers class and there are lots of samples! My remedy is to make a long enough warp so that I can make a scarf or runner or something after I’ve done the samples. Then I satisfy my need to have something useful when I’m done.